Amazing! Very friendly staff, clean rooms (deluxe double room is definitely recommended), good food, very good drinks and as much party as you prefer! An inside travel agency where you can book treks and trips that are reliable and fun! Basically everything you need in Cusco! Really great hostel. The water pressure wasn’t great but showers were hot. The rainbow mountain & red valley tour is highly recommended! The beds are amazing! 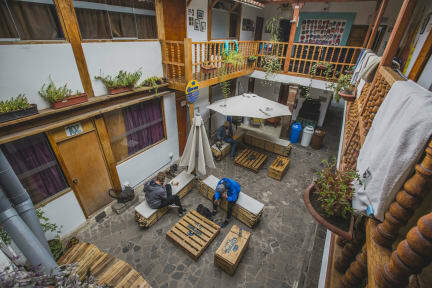 Overall the most comfortable hostel I stayed in South America. Helpfull and friendly staff, comfy beds and great bar. Highly recommended! Nice hostel with some atmosphere and good location in the city. Improvements: add handle bars for upper dorm beds, as it is quite dangerous without.